The durability and productivity you’re looking for regardless of material! Meadows’ hammer mills are second to none and have the size and power to fit your needs without sacrificing value you’ve come to expect from Meadows! 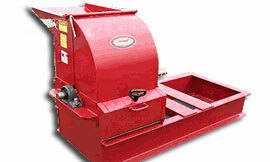 Meadows hammer mills are durable utility grinders capable of grinding most dry, free-flowing materials. 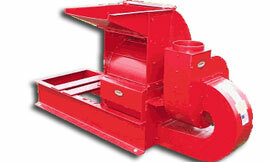 Hammer mills operate on the principle that most materials will grind or crush upon impact with the hammers. The material is fed into a hammer mill from the top and gravity falls into the grinding chamber. The material is contacted by a series of rotating hardened hammers. The material is ground by repeated contact with these hammers, contact with the walls of the grinding chamber, and particle to particle contact. The material remains in the grinding chamber until it is suitably sized to pass through the perforated screen that covers the bottom half of the grinding chamber. 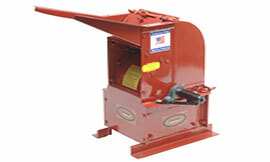 We offer six (6) models in our line of commercial hammer mills. The output, or rate of production, of the hammer mill is dependent upon the screen size, shaft speed which is typically 3,600 rpm, and the configuration of the hammers. We offer hammer mills in a bottom discharge configuration (gravity discharge) and we offer hammer mills in a materials-handling fan discharge configuration. 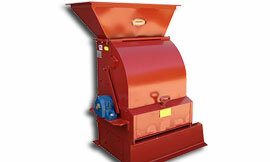 Bottom-discharge (gravity discharge) hammer mills may be used when the product to be processed will be processed to a consistency 1/16” or larger. Materials-handling fan discharge hammer mills must be used when the product will be processed to a consistency 3/64” or smaller. Our bottom-discharge hammer mills are limited to the following interchangeable screen sizes, 2”, 1/1/2”, 1”, 3/4”, 5/8”, 17/32”, 1/2”, 3/8”, 11/32”, 5/16”, 1/4”, 3/16”, 5/32”, 1/8”, 3/32”, 5/64”, and 1/16”. Our material-handling fan discharge hammer mills may utilize the screen sizes previously listed as well as 3/64”, 1/32”, and 1/64”. The screen sizes listed are the diameter of the perforation measured in inches. 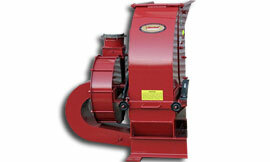 Our hammer mills may be belt driven or direct driven with an electric motor, gasoline engine, or diesel engine. Electric motors are available for 60-hertz single-phase electric supplies, 60-hertz 3-phase electric supplies, and 50-hertz 3-phase electric supplies. Parts for all Meadows hammer mills may be purchased by contacting Meadows Mills directly. We are happy to evaluate any product free of charge. If you are interested in sending a product for evaluation please contact Brian at 1-800-626-2282 or 336-838-2282. By evaluating your product we are able to prove the capability of our hammer mills and determine the proper model, the proper configuration, and the appropriate drive method to suit your needs. 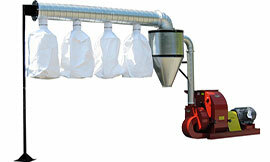 Our engineering staff is also available to assist in designing an efficient system to handle your product. Whether you need a complete layout or simply need to fit a new piece of equipment into your existing layout, our staff is available to assist you.